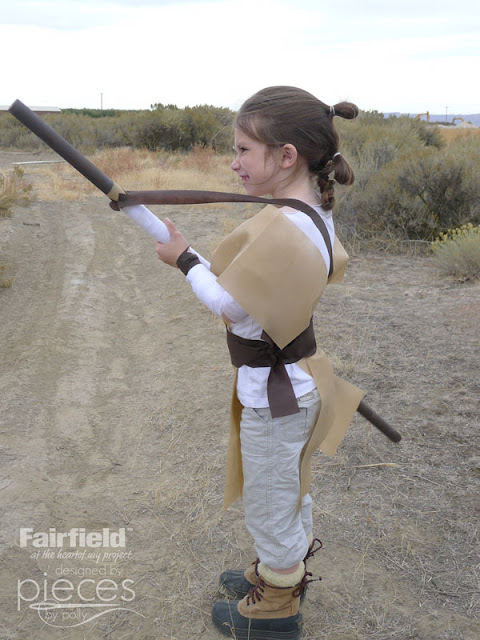 This Rey Skywalker costume is SO easy to put together. You'll be done in less than 10 minutes with some Oly-Fun™ craft material and a few wardrobe staples, and NO sewing involved. 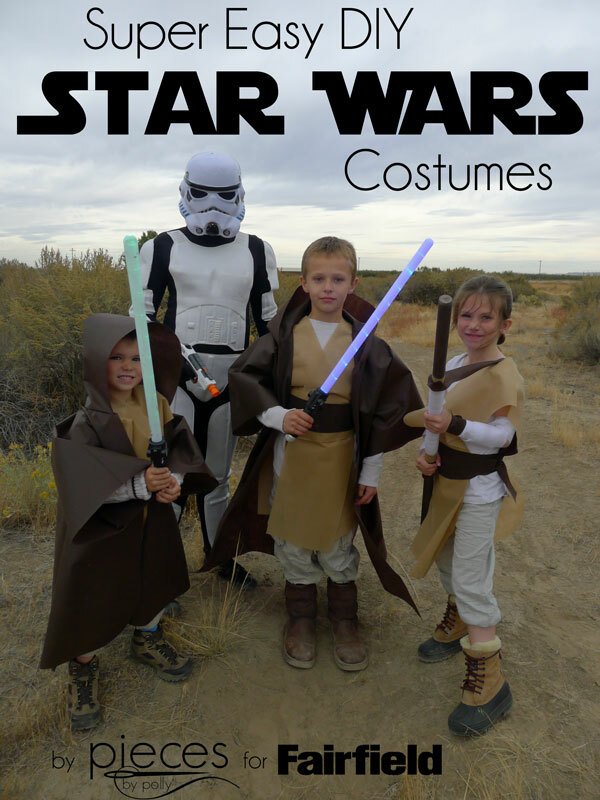 With Star Wars The Force Awakens so popular this year, this costume is sure to be a crowd-pleaser. And a big thanks to Fairfield World for supporting my blog by providing me with materials and compensating me for this post. All thoughts, ideas, opinions, and enthusiasm are all my own. This post contains affiliate links. 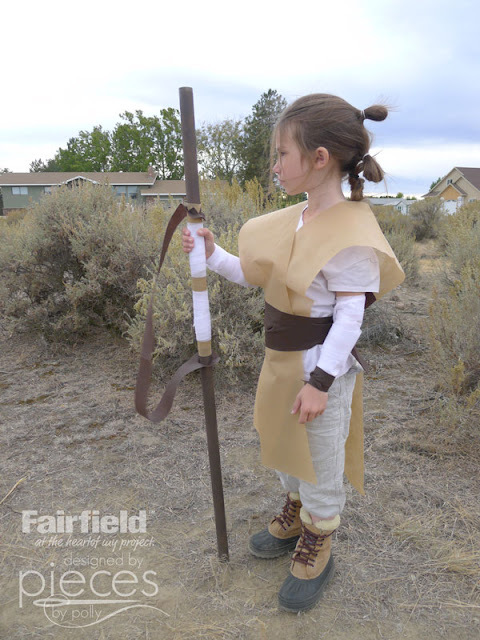 Need a Jedi costume to go with your Rey Costume? 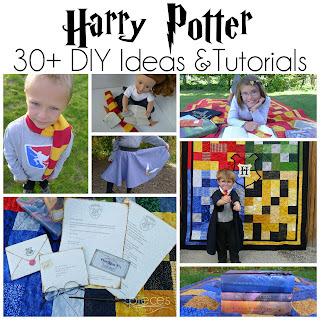 You can find my instructions for how to make one in under 30 minutes on the Fairfield site here. 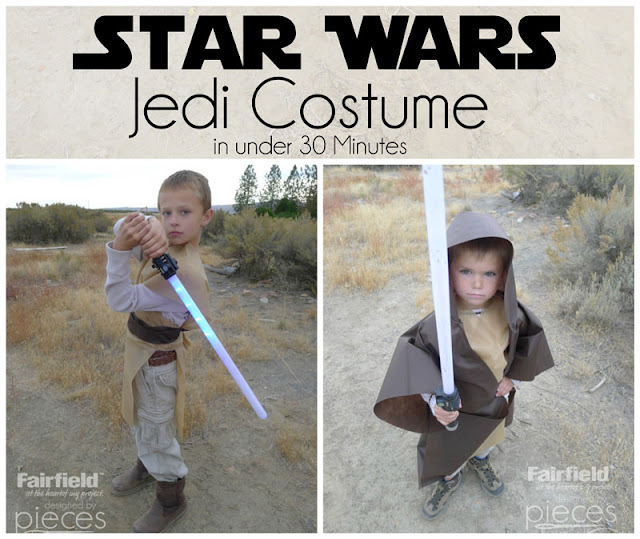 Jedi Costume with Oly-Fun in Under 30 minutes. 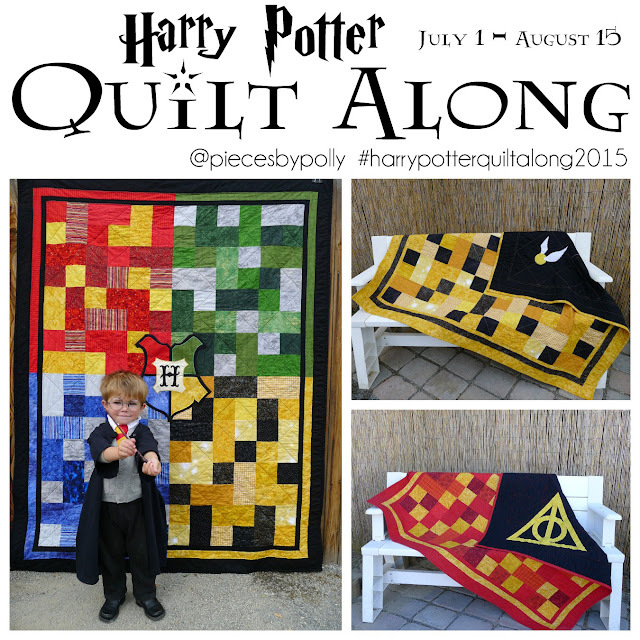 1/2 Yard for a child or 2-4 yards for an adult. Tan Oly-Fun™ by the yard or 1 Tan Oly-Fun™ Craft Pack (Measure from your shoulder to where you want the drapy part to end. Then double that...that's how much tan material you will need. In our case, we needed about 60 inches which is how wide the Oly-Fun™ comes, so we were just able to use the width of fabric. 1/2 Yard Snow Oly-Fun™ by the yard or 1 Snow White Oly-Fun™ Craft Pack. (You may want to increase this to 3/4 yard for an adult. 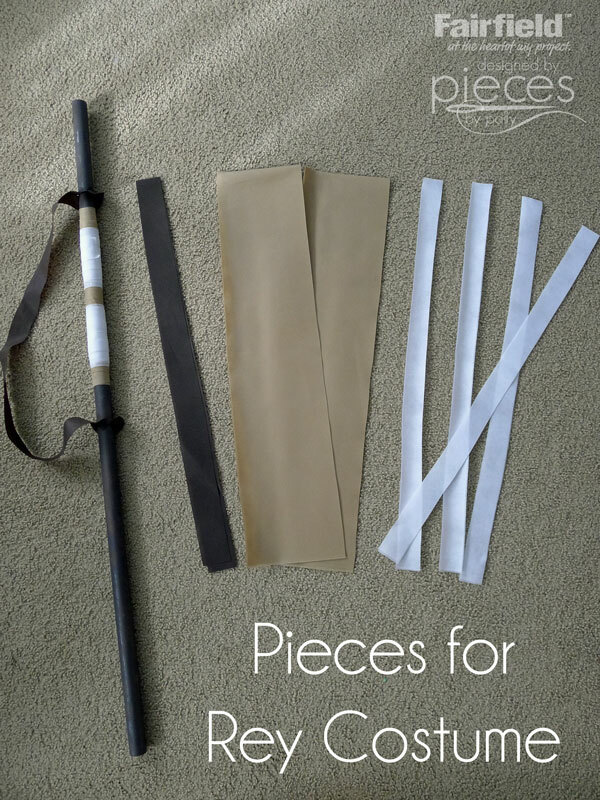 1 Rey's Staff (Instructions here) which will about double the amount of the materials needed above if you're making your own. Buying Tip: If you're not already familiar with Oly-Fun™, it's a craft material that will not fray or tear, but cuts easily with scissors. It can crease, so I prefer to use Oly-Fun off a bolt rather than the craft packs, and when you bring it home from the craft or fabric store, you want to roll it, rather than fold it. No need to add creases and we want Rey to look drapey. Start by choosing the clothes you're going to wear underneath. A white feminine fit T-shirt or tank top is great. 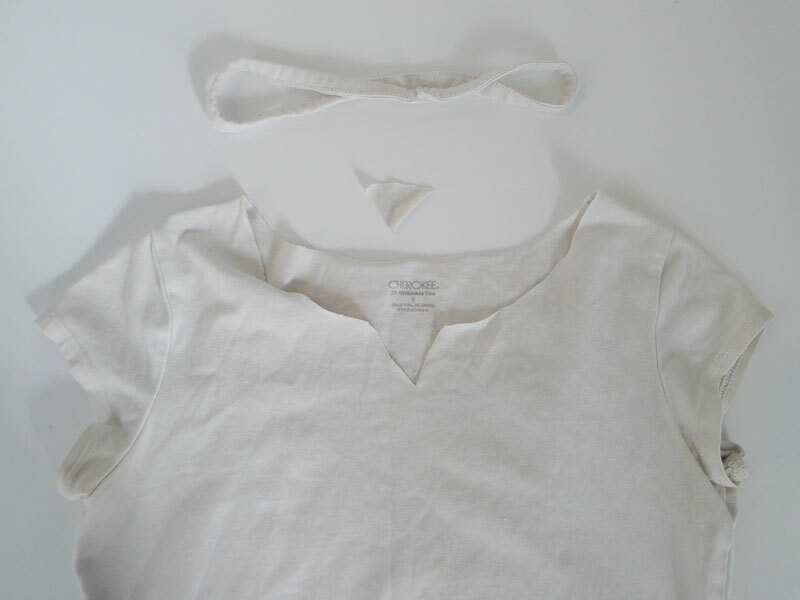 We chose to trim off the collar and cut a small V neck into it to match Rey's shirt better. This was an old one that had gotten slightly stained...all the better to fit Rey's character. Choose tan, or light grey, earth toned pants or capris. If you don't have any in your wardrobe, then check at a thrift store. My daughter is actually wearing some of her little brother's khaki pants which help with them looking short. Also look for some plain brown boots. We didn't want to break the bank, so she's wearing some winter boots. Now you're ready to cut your Oly-Fun. Cut two wide strips of Tan Oly-Fun™. The photo shows our strips folded in half. You want these to be just a little less than the width of Rey's tummy as seen from the front. For a child cut 1 strip (about 1 1/2 inches wide) of darker brown Oly-Fun for the belt. For an adult or larger child, you'll need 2 strips. Cut multiple strips of white about 2 inches wide for wrapping her arms. Fold the tan Oly-Fun in half and drape over each shoulder. Cross these pieces across her tummy and across her back. Keeping these crossed, use the brown piece to tie a belt, wrapping it around twice. For an adult, you'll tie two separate pieces. Wrap the white strips around her forearms and tuck the ends into the parts you've already wrapped to keep them in place. You can really go the extra mile by cutting a final thin strip of the dark brown Oly-Fun™ and wrapping it around Rey's left wrist. Don't forget to click here to learn how to make Rey's Staff on the Fairfield World Site. Trying to put together a whole group? 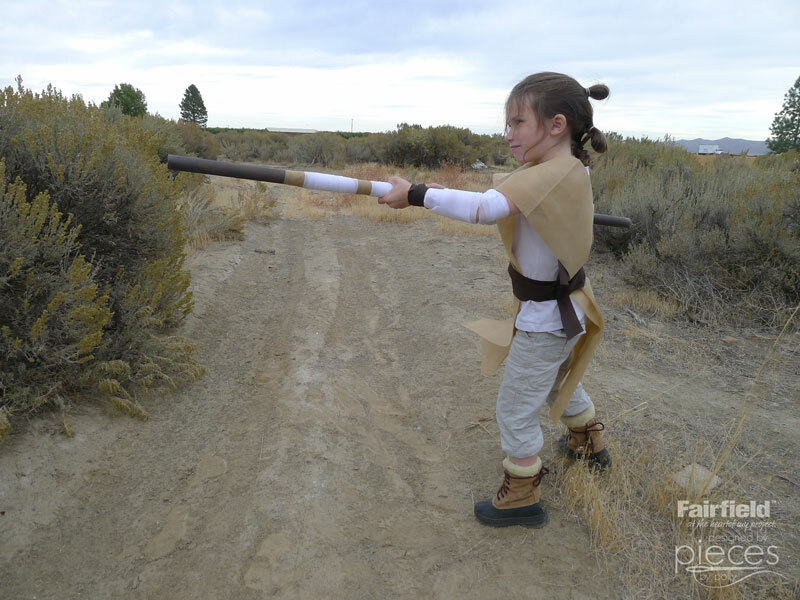 Check out my tutorial for making the Jedi Robes and costumes here. 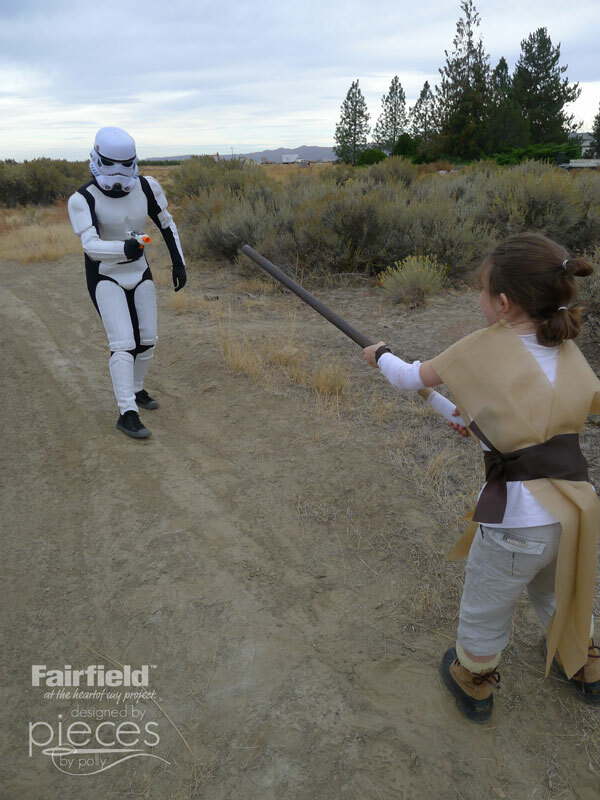 Storm Trooper costume is NOT homemade but was purchased here. Storm Trooper Nerf Blaster Gun came from here.